With US electricity demand stalled, expanding wind and solar power is increasing the economic pressure on equally low-emission nuclear power. New state incentives for nuclear plants are facing resistance from the beneficiaries of renewable energy subsidies, as both battle for market share. It's an old adage that a growth market has room for all participants, including new entrants. The US electricity market is now experiencing the converse of this, with increasing competition for static demand leading to headlines like the one I saw earlier this week: "Lifeline for Nuclear Plants Is Threatening Wind and Solar Power." The idea behind that headline is ironic, considering that for more than a decade renewables have depended on government mandates and incentives to drive their impressive expansion. Along with recently cheap natural gas, they have made conditions increasingly difficult for established generating technologies like coal and nuclear power. In the case of coal, that was an entirely foreseeable and even intentional outcome, but for nuclear power it has come as a mostly unintended consequence. Much as the slowdown in gasoline demand brought on by the recession created a crisis for biofuel quotas, stagnant electricity demand has hastened and intensified the inevitable fight for market share and the resulting shakeout in generating capacity. US electricity consumption has been essentially flat since the financial crisis of 2008-9, thanks to a weak economy and aggressive investment in energy efficiency. More generation serving the same demand means lower prices for all producers, and fewer annual hours of operation for the least competitive of them. At the same time abundant, low-priced natural gas from soaring shale production has made gas-fired turbines both a direct competitor in the 24/7 "baseload" segment that coal and nuclear power formerly dominated, and the go-to backup source for integrating more renewables onto the grid. The US is essentially swimming in energy, at least when it comes to resources that can be turned into electricity. The only rationale left for the substantial subsidies that wind and power still receive--over $3 billion budgeted for wind alone in 2017--is environmental: mainly concerns about climate change and the emissions of CO2 and other greenhouse gases linked to it. That's the same reason why some states have become alarmed enough by the recent wave of nuclear power plant retirements to consider providing some form of financial support for existing facilities. Nuclear power isn't just the third-largest source of electricity in the US; it is by far our largest producer of zero-emission power: 3.5 times the output of wind in 2016 and 22 times solar. A large drop in nuclear power is simply not compatible with the desire to continue cutting US emissions. Environmental groups like EDF are reaching similar conclusions. I can appreciate why utilities and others that are investing heavily in wind and solar power might be convinced that providing incentives to keep nuclear power plants from retiring prematurely is "the wrong policy." After all, we have collectively pushed them to invest in these specific technologies, because it has been easier to reach a consensus at the federal and state levels to provide incentives for renewables, rather than for all low-emission energy. 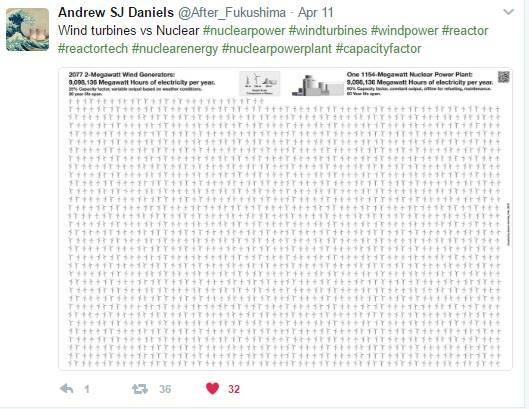 As long as we are promoting renewables in this way, though, we should recognize that nuclear power is no less worthy. The biggest benefit of renewables is their low emissions (including non-greenhouse air pollutants,) an attribute shared with nuclear power. Yet because of their much lower energy densities, requiring much bigger footprints for the same output, and their lower reliability, incorporating a lot more renewables into the energy mix requires additional investments in electricity grid modernization and energy storage, along with new tools like "demand response." Nuclear power is compact, available about 90% of the time, and it works just fine with the existing grid. By experience and philosophy, I'm a big fan of markets, so I would normally be more sympathetic to the view expressed by the American Petroleum Institute that states shouldn't tip the scales in favor of nuclear power over gas and other alternatives. However, we don't have anything resembling a level playing field for electricity generation, even in states with deregulated electricity markets. The existing federal incentives for wind and solar power, together with state Renewable Portfolio Standards, are already tipping the scales strongly in their favor. These subsidies will remain in place until at least 2022, consistent with the most recent extension by Congress. Why do renewables merit such subsidies more than nuclear power? Wind and solar power are key parts of the emerging low-emission energy mix, and we will want more as their costs continue to fall, but not at the expense of much larger low-emission energy sources that are already in place. Less nuclear power doesn't just mean more renewables. It also means more gas or coal-fired power. That's the experience of Germany's "Energiewende", or energy transition. As long as that is the case, and without corresponding incentives for equally low-emission nuclear plants, as well as for fossil-fuel plants that capture and sequester their CO2, we will end up with an energy mix in the next few years that is less diverse, less reliable, and emits more CO2 than necessary. I wouldn't consider that progress.